Centre County D.A. Stacy Parks Miller with Timothy Piazza'a parents Jim and Evelyn Piazza in May 2017. It should not take a wrongful death lawsuit, as was filed a week ago against 28 onetime Pennsylvania State University fraternity members from Malvern, Downingtown, Philadelphia, Wayne, Phoenixville, West Chester, and beyond, to keep that incredibly important conversation going. 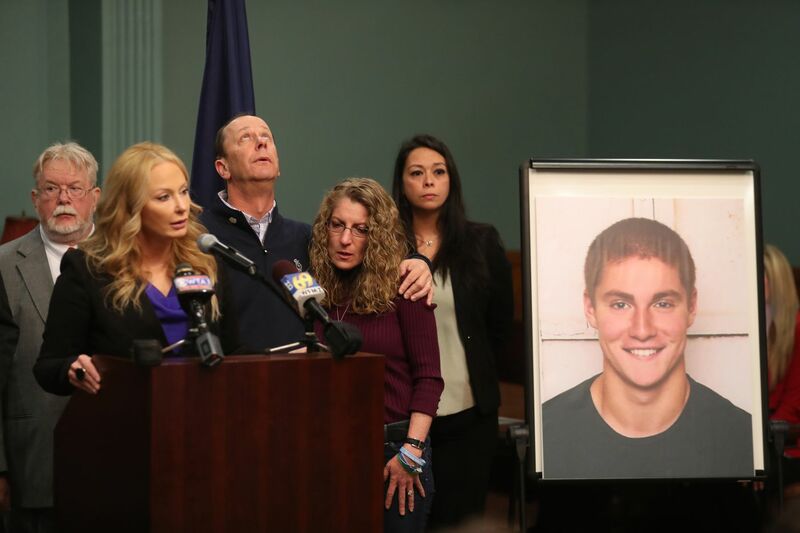 It should not have required a criminal case against the young men implicated in a fraternity pledge’s death, nor the airing of a graphic frat house video showing Tim Piazza’s wrenching final hours on Earth two years ago this month, to illustrate the devastating cruelty and moral indifference that some of our brightest young souls are capable of even after gaining entry into elite, competitive, acclaimed universities such as Penn State’s main campus. And yet, if the ongoing collateral damage from the horrific Piazza case helps end our societal love affair with bullying, I’ll take it. Jim Piazza and his wife have been partnering with fraternities since their son's death at Penn State to make conditions safer for students joining these clubs. Bullying is wrong when you are 9 years old. At age 19 and in college, it is quite simply unacceptable. Yet even after Tim’s death, booze-fueled hazing has continued, as Penn State reported a few weeks ago to comply with a new anti-hazing law in Pennsylvania. I asked one of the region’s foremost experts on bullying, Children’s Hospital of Philadelphia psychologist Stephen Leff, if I was making too much of a leap in comparing the dynamics of college hazings generally to a form of bullying.